I am presenting to you four incomplete pieces of work. Two of them aren’t terrible, while the other two I didn’t get far because my hand and brain were not in sync, and I stopped rather than struggling forward because I didn’t want to spend time on something that wasn’t even close to what I wanted it to be. Before I show the images, I have a story. Out west there are lots of fires burning. So much so that my city (not even near the fires) has been very smokey and there have even been health warnings in effect. It has cleared up a lot now, but during one of the worst times when the smoke was so thick, it looked like a pink fog covering the city. On this day, I was driving and looked out over our river valley and was stunned by the beauty! Layers of thick pink smoke, with layers of trees peeping out. I couldn’t take a picture where I was, and honestly, I was hungry and on my way to get food, so didn’t try to stop either. But I couldn’t get the image out of my mind. So I tried to paint it from memory. Don’t laugh…Here is my first attempt on a 9″ x 12″ canvas. An attempt of trees and water with a pink sky. Acrylic paint on canvas. I clearly have no clue how to paint trees. Looking at a picture, I can copy decently, but man, this time my brain failed me. I think the main issue is the perspective (my nemesis). I have a basic understanding that the farther away something is the smaller it appears, also there should be fewer details and distinctive colouring. BUT I can’t seem to put this knowledge into practice! In this painting, the front trees are WAY too small and the trees father back seem to get larger…AND the front trees are suddenly in the river. WTF? So I stopped. I know I could have continued and made alterations, but it just wasn’t what I had in my head. 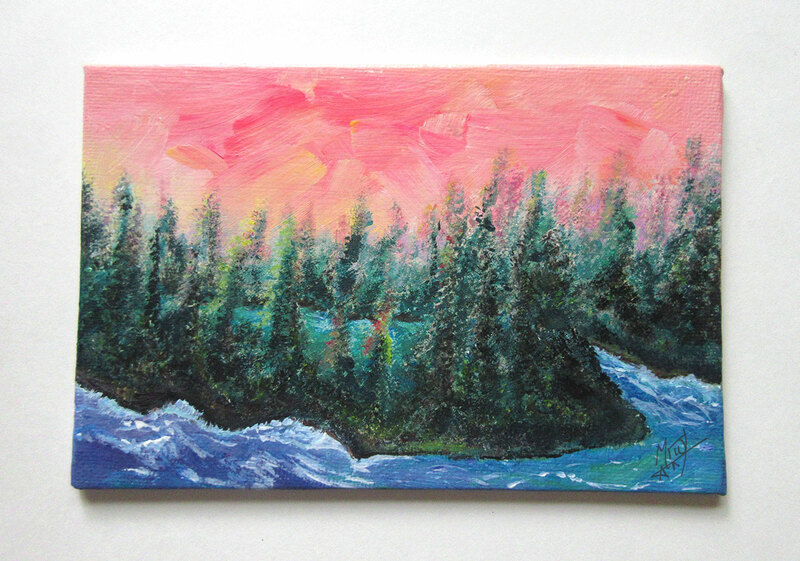 So here is my second attempt on another 9″ x 12″ canvas. Second attempt of trees and water with a pink sky. Acrylic paint on canvas. This one I like better. I get the sense of haze, and this one is more workable to go back and alter if I want, but where it fell apart was the base of the trees. I knew that there should be a river bank of some sort so the trees aren’t in the water, but I think I was getting tired and sloppy at that point. My paint was getting muddy and I was frustrated. So I stopped. Later I pulled out a used 5″ x 7″ canvas to give it another go. I got tired of wasting the larger ones which will have to be Gessoed now so I can re-use them again in the future. Here is my third attempt. Third attempt. Where did the trees go? Acrylic paint on canvas. Not quite a forest… With this one, I was playing around a bit. 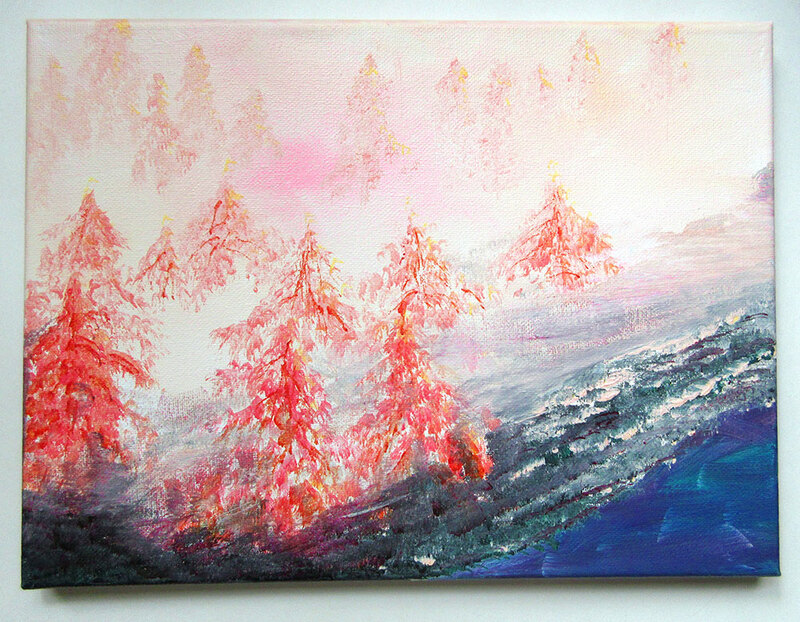 I was going to paint trees going up the mountains, but then it looked terrible, so I smudged them into a mist. I actually like this painting the best, but I wish I hadn’t added in the clouds above the mountain tops. I don’t like them, they look messy and detract from the sunset beyond. Oh well. Now here is my cover shot, the fourth and final attempt. 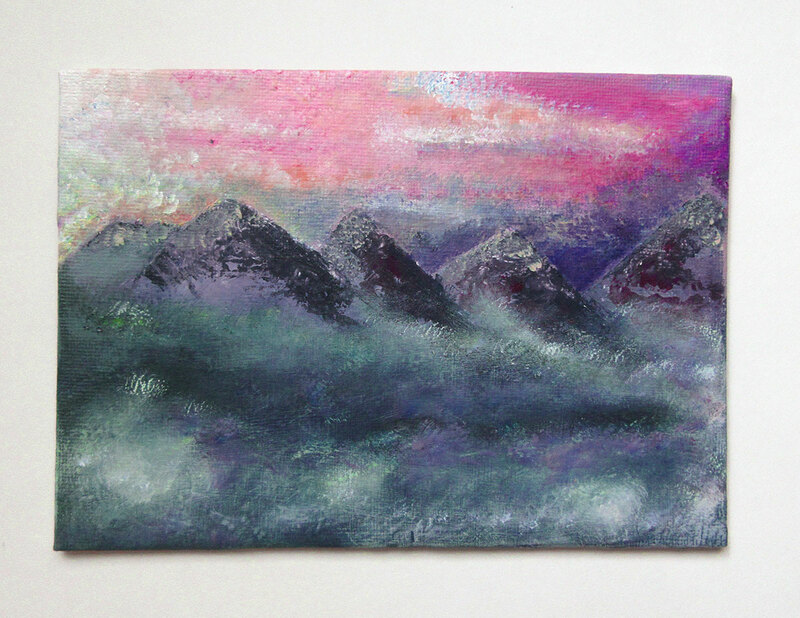 Another old/used canvas for this one, a 4″ x 6″ this time. Maybe I’m just better at painting on smaller canvases? LOL, I don’t know. 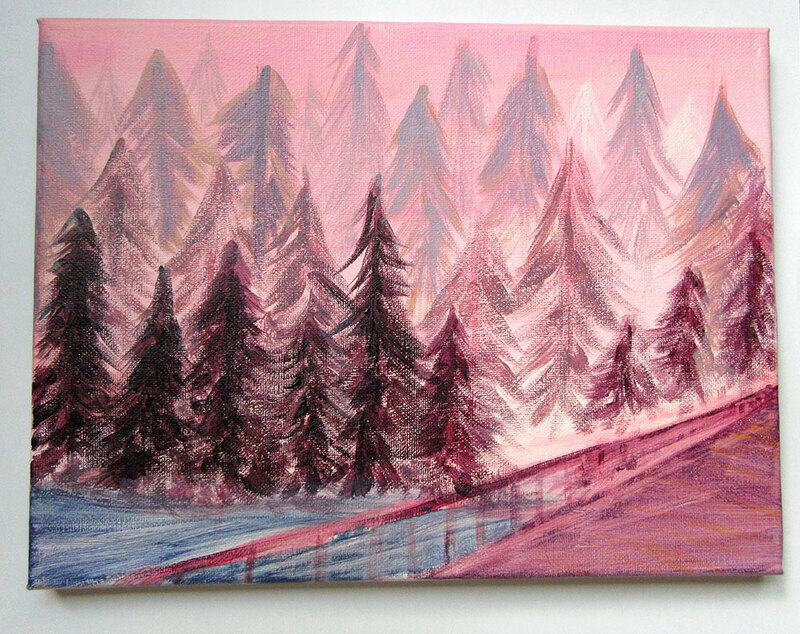 Acrylic paint on canvas of trees and water with a pink sky. This one has its quirks. I like it, but it also makes me uncomfortable. Again, the perspective I think. I like the water, but it looks like a flood is about to happen! The trees are too skinny and still don’t convey the depth I was trying to make. And where is the haze of smoke? Oops! I actually really like the sky even though it doesn’t match the rest of the painting’s style. I think I’m going to try a new painting in the style of the sky. I like the texture and turbulence of it.